I returned them because of the color but when I got the new color , I was very happy and satisfied. They are exactly what I was looking for and I have no complains. They don’t seem to collect dirt/dust which makes me even more happy. I had them hanging for 3 yrs and they looked like new and clean. Then I re did my whole bedroom and guess what; I bought these again in Smokey plum. Yup, they are that great! Highly recommend it. 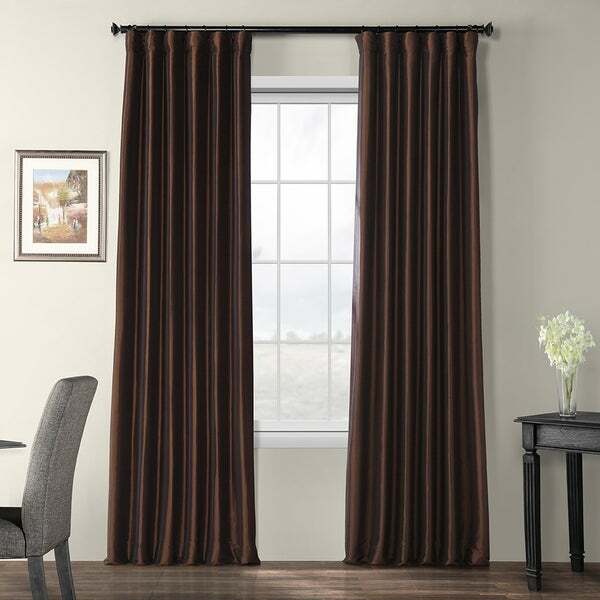 Enhance your room with the rich look of this faux silk taffeta curtain panel. Crafted with a light-blocking lining, the panel features a crisp, uniform look, a heavy weight, and a slight sheen that will lend a hint of opulence to your decor. The beautiful curtain is available in a variety of colors, and is designed to block natural light, help to insulate against heat and cold, and block out ambient noise for a more peaceful and stylish interior. For proper fullness, panels should measure 2 - 3 times the widthof your window. Dimensions 108.0 In. X 50.0 In. X 0.25 In. I bought 6 of the 108 inch length panels in the paprika color. The color is darker than what I see in the picture...more of a cinnamon color than rusty brown...but still beautiful. The faux silk material is very rich looking. The inner blackout lining is heavy (and literally a black color,) and the outer white lining is also a heavy material. These definitely block all sunlight! They arrived folded in separate packages and really need ironing to flatten the folds out, but unfortunately, you have to iron the seams on all 4 hem edges really well, too. The sewing machine tension used was much too tight so you have to stretch the material seams while ironing them to make the puckered stitches lie flat. Two of the 6 panels are just too puckered no matter how much I ironed them so I positioned them where they showed the least. Don't use steam! It puckers the material. Iron with the faux silk side facing up using a nylon pressing cloth that is designed to protect fabrics from getting shiny. Use a high setting, (I used wool setting,) or else you'll be wasting your time on these thick panels. I set my ironing board up next to a queen bed so that I could iron and keep material resting on a flat surface, flipping the panel around to do the second half without the first already-ironed side from puddling on the floor. I also used the ironing board for a sturdy flat surface to use for inserting the drapery pins into the hem tape at the top of each panel. Use a metal thimble if you have one since these material layers are thick. With the weight of the curtains and the heavy bold pole and rings, you have to buy extremely large bolts to use in the installation of the rod supports or else they will pull out from the sheetrock wall. Install the supports into a stud if possible. I couldn't due to concrete block construction, so my rod with 4 panels pulled out using bolts suited for 75 lbs of weight each! Was told that means steady, fixed weight, not moving weight as in pulling the curtains open and closed. Also, I'm using drapery pull "baton" rods attached to the inside end drapery ring of each side to help with pushing the panels open and closed. The weight makes it difficult to move the panels over the pole where the pieces of the rod extension points are. It may have been worth it to splurge on a traverse rod in the long run. But the look and blackout function are great...designer looking at a fraction of the price! Absolutely perfect curtains! Blocks all of the sunlight in our room and really helps keep it cool from the heat of the afternoon sun. I was so pleasantly surprised by how much cooler our room was in the afternoon. My husband in a doctor and he works many night shifts. He needed the curtains to block the light so he could sleep during the day, and as an added bonus they have kept the room almost 10 degrees cooler as well! The Navy color is crisp and exactly the color shown online. I had purchased two other nave blackout curtain brands only to return them as they were such poor quality! These however, are so well made and they have an elegant tailored look. They are lined but not too stiff and very easy to hang. I'm actually purchasing more for the rest of our house because I'm so happy with their quality and they just look fabulous. They are beautiful but measure 48 x 84 not 50x84.I will keep them and just order another pair. I'm conflicted on how many stars to give this product, because while I really liked the way it looked, the measurements were WRONG! I ordered four 120 inch panels and all of them measured 116 inches. I ordered two 108 inch panels and each of them measured 105 inches. Of course I found this out after spending over an hour ironing each of them. What a huge disappointment. There was also a faint yellow spot on one of the panels, maybe about the size of a coffee cup. It wasn't very noticeable and I wouldn't have returned it for that issue alone, but it was strange. The lining was also "off" on the sides of each panel, but again nothing I would have returned it over specifically, but it is worth mentioning. Overstock customer service was great and issued me a return label, but the only thing they could offer for the inconvenience was a 10% coupon. Really? You offer this all the time. You should have offered something a little more substantial for having to repackage 6 (very long) curtain panels, drive to the UPS store and haul the 20 pound box across the parking lot. Yes, I'm a little bitter about that. ;) Next time try offering a 20% off coupon or something else that you don't get every day in your inbox. I was looking for some lighter curtains to replace the heavier custom made dark drapes in the room. 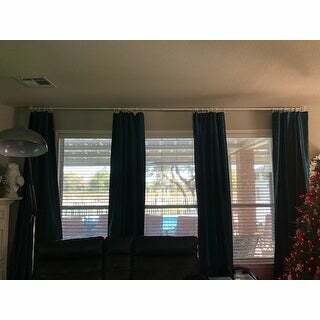 They are not the same quality as my custom drapes, but they are a nice quality for non custom drapes. They come as flat panels and if you are not putting them on pocket rods, you will need to work on where to place the hooks to make them work on your rod. I loved the antique beige and the fact that it blends well with my other variations of beige in the room. They come in a zippered plastic bag and the wrinkles may need some steaming to remove. Med Blue Color is GORG! These are heavy, long and wide. Love the color and the feel!! Blackout works well too. I love these curtains! I wanted heavy and rich looking curtain panels for my bedroom, and these are perfect. I would have given them 5 stars, except the back tabs are not very sturdy (if you want to clip rings onto them). I instead just clipped rings onto the fabric itself, but would have rather used the sewn in tabs. I ordered them in navy and the color is perfect! I ordered Mediterranean - 108-Inch. The color is amazing. They were perfect to add a pop of color to light grey walls and dark grey furniture. They are lined and weighted which makes them hang beautifully. LOVE LOVE LOVE them! 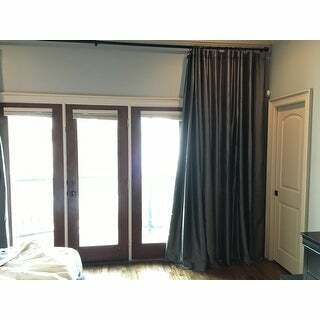 These drapes are great quality, have weights in the hems so they hang perfectly, and completely block out the light for a great night's sleep. The fabric is beautiful and nice to the touch. They look like they were from a high end designer! These curtains look very expensive! These are true blackout curtains. The graphite color is a rich dark grey and is heavy material and even has some weights on the bottom. The hook belt is great for arranging the curtain hooks so they hang nicely. I purchased 6 panels and will be sowing 3 of them together on each side to make a long panel since my French doors are 160" long. These drapes were exactly what we were looking for to achieve the designer look. The weight is very heavy and the blackout ability is accurate. I wish I could upload a picture with this review to illustrate how obviously wrong the lining is in this curtain. It is solid black and shows through the taffeta which gives the entire panel a dingy and grey look. The lining is also partially exposed at the bottom in stark contrast to the panel where it hits the floor. The panel also came out of the package with dirt and dust marks. I have been thrilled with all of my past purchases from Overstock but buyer beware on this one. Beautiful curtains they absolutely and look custom made. Bought these for my son's room.He loves the dark gray color and said he still thought it was nighttime because they blocked the sun so well. A friend had purchased multiple panels for her dining room to cover a large window and had a seamstress sew them together to make 2 huge, super full panels- STUNNING. Can't recommend these enough. 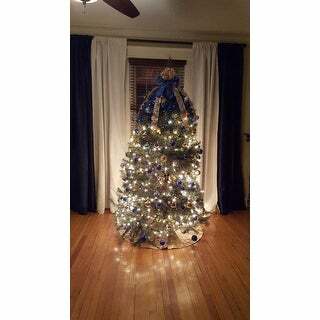 After having spent thousands on custom drapery, I could kick myself for not checking Overstock first. I am a convert! Beautiful curtains, but not truly blackout. For reference I purchased these in Mediterranean. The reason I'm giving these 2 stars is because they're advertised as blackout curtains, when in reality "room darkening" curtains is more of an accurate representation of their capabilities. If blocking out as much light as possible is a priority for you, although these are beautiful I suggest you look elsewhere. Note: I'm not drawing this conclusion from the light that escaped from the top (as this is unpreventable unless you purchase a swag) I'm just making the observation that the light is actually going through the fabric. I placed my order close to the holidays in preparation of our annual family pictures. The delivery process was quick and transparent. The curtains arrived before the expected delivery date. The quality of the curtains is phenomenal. The length and thickness meet the needs of our 9 feet ceilings. They have also helped to insulate heat. Plus they matched the color scheme of the pictures perfectly! I am very satisfied with my purchase. Love them. Truly blackout and nice quality. I’ve had them several years now and they are still beautiful. These are great curtains. Well-made and beautiful. I'm really satisfied with this purchase. Nice,heavy curtains that do a pretty good job of blocking the sun in my granddaughter’s room. They look more expensive than they were. Very thick. Beautiful fabric. Look much more expensive than they are. I purchased 4 panels for my bed room. I wanted an expensive looking fabric but for a fraction of the cost. I went with the white and let me help you to decide on a purchase you're thinking of making. Buy these drapes. The quality is beyond comprehension for the cost listed. It truly doesn't make sense how great these are! The silk is top quality, the stitching is perfect, no fraying, comes with a black out feature which is a thick material backing the silk drapes. If you dont have blinds on your windows, this drape will block 90% of the light, but with blinds already there, this is fully blackout. We have ugly brown blinds so I went with the white drapes to conceal them. You cannot see through these drapes, they are solid. The white silk is also a little shiny, almost like a pearl, subtle shine, so it looks very expensive and very glam. It's also very white. It states eggshell, but its more alpine white which is exactly what I wanted to create a classic, clean look. I'm ordering 2 more panels for our room. 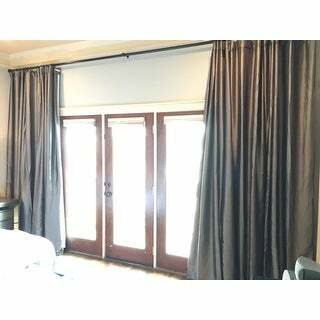 These are very very high end looking and even have weights in the hem of the drapes to help keep your drapes straight and in place. Best buy ever! 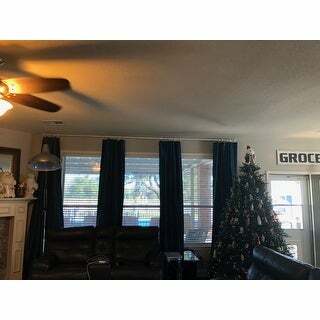 These curtains are a great addition to our space. They are simple and classic with a nice sheen. They are not overly shiny and provide a nice amount room darkening and privacy. "Do these panels have any texturing (horizontal lines/threading) or are they completely solid? I’m buying to supplement white solid curtains I already have and am hoping the eggshell panels will fit in. Thanks!" Characterized by an ultra-smooth texture and a fair amount of sheen, our faux silk taffeta curtains have the look and feel of the real thing. For texture, we recommend a Faux Silk Dupioni curtain. "Do these have a flannel interlining "
No, there are no flannel interlining. There is a white fabric behind the actual curtain for extra light-blocking. "Is the paprika anywhere close to a cinnabar COLOR"
The Paprika has more orange hues than cinnabar. "Is there any yellow tone to the gold curtains?" There isn't a "gold" option in this item but if you're referring to the Antique Beige, it has a soft cream tone to it. More like a tan not yellow. "I'm afraid the true white is going to be too bright. Would you recommend eggshell - still a white but not as bright as the true white?" Eggshell is a lighter off-white. It is not as stark as a true white. "When you click on the platinum color drapes, what appears in the box seems to be the eggshell colored drapes? I am assuming platinum to be a grey tone." Platinum can be seen in the 3rd picture or when hoovering over the platinum option. "What exactly is the color - Syrah? Burgundy, red, cool or warm color? Thank you!" Syrah is a warm garnet. Please see image 6.